These lightweight GM 604 Crate Cheater harmonic balancers are made from billet aluminum. They reduce rotating weight, lower the moment of inertia for quicker acceleration and increase horsepower. They feature a steel outer sleeve that a magnet will stick to. 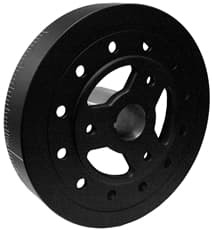 25126 Harmonic Balancer-Chevy-8"-Alum-Crate Motor, Weighs 4.01 LBS. (Same as Stock Size & Over 8 lbs. Lighter! ).